Guy and I went to the Roman Baths after the workshop today and we were impressed. It is funny.. when I was in Istanbul and Ephesus two years ago and we were visiting the ruins, these ruins belonged to the Greeks. Today I had the same feeling, to the Romans that arrived in 46 AD! However, as I am presently reading Rutherford’s Londinium book on the history of this city, I know that these ruins belong here and not elsewhere… reading is important for understanding our world. Colours: Naples Yellow, Raw Sienna, Burnt Sienna, Ultramarine & Pyrrol Crimson Location: Pulteney Bridge, Bath, UK. 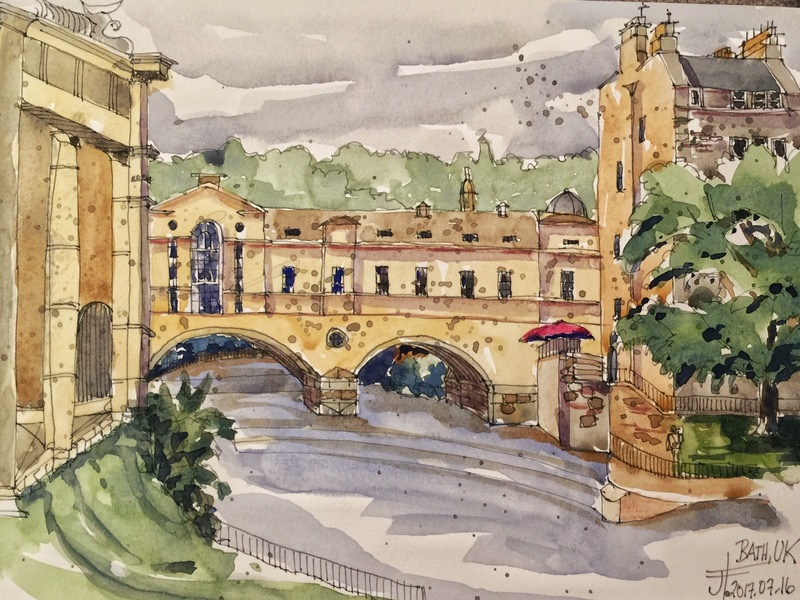 This entry was posted in Sketches / Drawings / Paintings, Urban Sketching and tagged Aquarelle, Stillman & Birn, watercolours. Bookmark the permalink. You could quite possibly be a GENIUS. Molones? What does that mean? ahhh! It is in Spanish — thank you! i want to know which type of colours u used, water colour or something else! Thank you Sudhir — glad that you like it! Ciao & bonjour, from a (former) Montrealer ;) Lovely painting – including the hint of red (umbrella? ), on a typically cloudy UK day. Thank you former Montrealer -))) yes you are right, it was a patio umbrella -! Wonderful watercolor Jane [said the guy who knows nearly nothing about art]. ;-) Ephesus was magical for me. Have you written about your trip there? Gorgeous picture! I’m in Bath quite a bit and you’ve really captured the atmosphere. A truly beautiful painting there. I just love the nature of art. Thank you so much Patrick!